This week is TNC18, the largest European research and education networking conference, which is being held at the Lerkendal Stadium in Trondheim, Norway – the home of current Norwegian Football Champions Rosenborg BK. 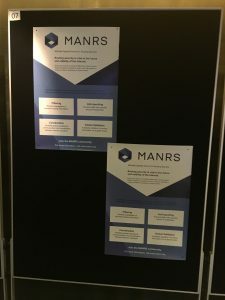 Of course we’re actually in a conference centre underneath one of the grandstands and not on the pitch, but this is still a premier event that brings together managers, network engineers, and researchers from R&E networks in Europe and the rest of the world. The Internet Society is not only one of the conference sponsors, but has a significant role in the programme as well. Our colleague Karen O’Donoghue on Monday spoke about NRENs and IoT Security in the ‘What’s Coming Next In Privacy Innovation‘ session, where she’s discussing the security and privacy challenges of burgeoning numbers of IoT devices and how these will impact R&E communities. ISOC is encouraging the development of best practices through the Online Trust Alliance’s IoT Security & Privacy Trust Framework, and this is a good opportunity to discuss how the NREN community can take the lead in adopting good operational practice. Karen will also be talking about Time and Security during the ‘Security‘ session on Tuesday. Time synchronisation is critical for many Internet applications, and for many years NTP has worked fine without any real consideration for security. However, in recent years there have been an increasing number of attacks on the time synchronisation system in order to create disruption and cause damage, so there has been ongoing work in both the IETF and IEEE to secure the NTP and PTP protocols. Our other colleague Steve Olshansky will be presenting on Blockchain and Digital Identity during the lightning talks session on Tuesday. He’ll be discussing whether Blockchain can be used for identity and access management, and what the implications are for user privacy and control over their identity. I was organising the GLIF session on Monday too, which focused on recent developments in the global lightpath space that are used to support large-scale high-bandwidth research applications such as the Square Kilometre Array and Global Research Platform. In particular, networks are increasingly becoming software driven as more services move into the cloud, and whilst this hides the complexity from users, it makes managing networks more complex and requires more sophisticated measurement and monitoring. 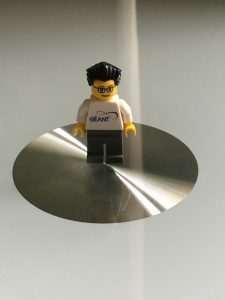 R&E networks cannot continue to justify higher bandwidth networks on a handful of big data research projects alone, and need to ensure good access to compute and storage clusters for the smaller research projects as well. 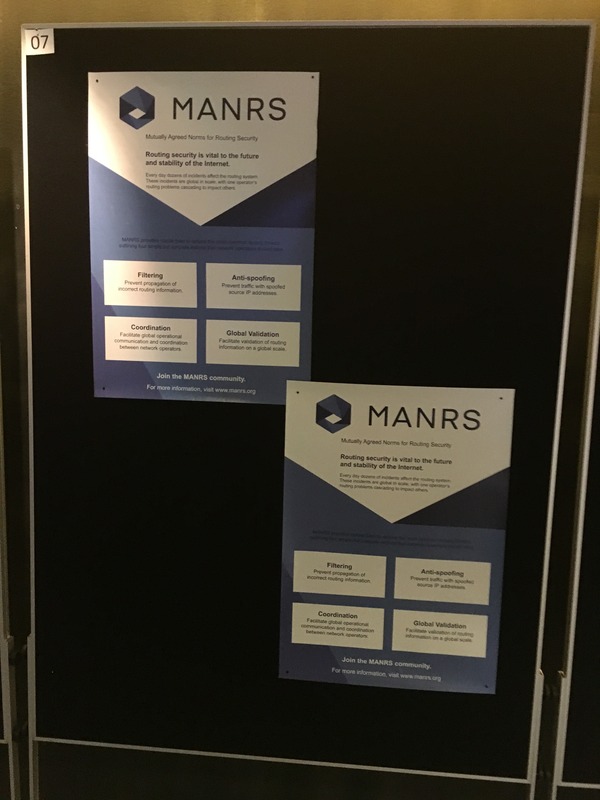 In addition, we’re raising awareness of routing security issues by providing some MANRS information in the conference poster session, as well as having some prominent ‘advertising’ around the venue. By offering four simple but concrete actions – namely filtering, anti-spoofing, improved coordination and global validation – network operators can collectively improve the security and reliability of the Internet. If you’re unable to make it to TNC18 in person, the sessions are being both streamed and recorded.